Find the Usage Stats box on the dashboard as seen here. 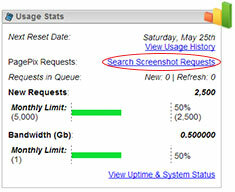 Clicking the "Search Screenshot Requests" link to the right of "PagePix Requests" will take you to the Thumbnail History page. PRO Users will also see the following search options if subscribed to the corresponding PRO Feature. If you first want details on how to perform a search, take a look at our Thumbnail History Search Guide. Once you have found the search results you are searching for (or if you want to export requests associated to your account --shown by default), then you may select an option from the "Export" dropdown selection and click "Export!." We support Excel spreadsheet format, CSV (comma separated values) format, and PDF format. Once you click "Export! ", a dialog prompt will ask if you want to open or save the file. Internet Explorer users may only see an open/save prompt at the top or bottom of the browser. Note: If you leave the Domain Search blank (or with just http://), you can adjust the results per page to show more results that are currently associated with your account. Whatever is showing on the page is what will be in the report. So, if you show more results, then we will include those in whichever file format export you choose. Note: The export feature fully supports UTF-8 characters in the output, but Microsoft Excel may not display them properly unless you select the "Excel" format. So, if you select "CSV" format and open it with Excel, any UTF-8 characters may display as garbled characters. This is a limitation with Excel; not our export feature. If you open the "CSV" format in a standard text editor that supports UTF-8, the characters will be preserved. Note: The PDF export defaults to "Landscape" to fit more details on the page, but if there are long URLs in the output, it may push some or all of the additional fields off of the page and will not carry over to another page. This is a limitation of the PDF export class we're using (best one available currently). The PDF format also supports UTF-8 characters.